Findings from the Gulf Coast Research and Education Center hop trials are helping make strides in this new frontier. Hops are an essential ingredient of beer. Breweries use different varieties and amounts of hops during the brewing process to attain the desirable levels of bitterness and flavors associated with the various styles of beers. The number of craft breweries in Florida has jumped in recent years, from 66 in 2013 to 243 in 2017.This burgeoning craft brewery industry has created a significant demand for locally produced hops, which coincides with growers’ dire need for alternative specialty crops to grow in Florida. The University of Florida Institute of Food and Agricultural Sciences (UF/IFAS) Gulf Coast Research and Education Center (GCREC) began testing hops in Central Florida in late 2015. The tests have been supported by the Florida Department of Agriculture and Consumer Services Specialty Crop Block Grant Program, Hillsborough County Economic Development, local brewers, specialty crop industries and allies, and GCREC. Findings from these tests are laying the necessary foundation for an emerging new industry in Florida. Among all growing conditions, what’s most critical for successful hop production in Florida is day length. The initiation of flowering in hop plants is triggered by shortening day length, generally below 15 hours. In the major hop production areas in the Pacific Northwest, day length is more than 15 hours in May and June, during which time plants grow up to 20 feet high and produce a lot of laterals. Hop plants initiate flowering in July as day length begins to shorten. This shift from vegetative to reproductive development allows high production of hop cones that can be harvested at the same time. By contrast, when growing hops in Florida, where day length is always shorter than14 hours, hop plant growth and yields are limited because flowering is premature and non-synchronous. Hops need to be hand-harvested multiple times, which is labor intensive. This problem can be overcome by artificially extending day length with supplemental lighting. In the2016 season (under natural day length), most hop plants grew only up to 12 feet,and hops had to be harvested 10 times because of unsynchronized cone development. This season, with the addition of LED lights to extend day length,all the plants grew to the top of the trellis (19 feet) and developed cones at the same time when the supplemental lighting was turned off. All the cones were harvested in a single harvest, and the yield was twice as much as that in the2016 season. 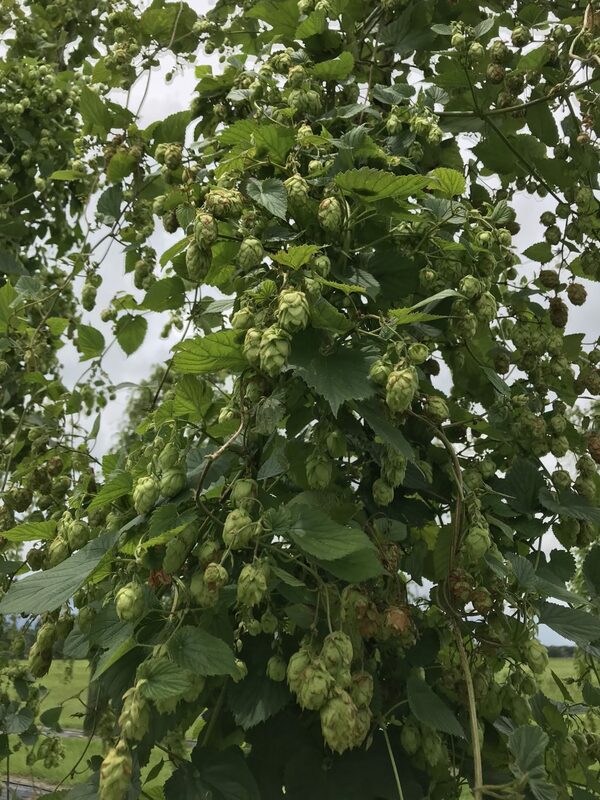 We have observed substantial differences among hop varieties in plant growth and height, sidearm (lateral shoot) development, cone yield and cone quality.Among the tested hop varieties, Cascade produced an average of 1.8 pounds of fresh cones per plant in spring 2018. If this variety is to be planted at 15 feet row spacing and 3 feet in-row spacing,it can potentially produce about 1,800 pounds of fresh hops per acre. The highest-yielding Cascade plant in the spring 2018 trials produced 3.9 pounds of fresh cones. In the Pacific Northwest, mature Cascade plants can produce up to10 pounds of fresh cones per plant. Comet, Galena and Nugget produced about one pound of fresh cones per plant (or an estimated 1,000 pounds of fresh cones per acre). Fresh hop cones need to be dried (or used) within 24 hours after harvest to avoid off-flavors. We dried the cones at about 142 degrees F in a drying room for about 25hours to reduce moisture to a range of 8 to 12 percent. On average, 3.6 pounds of fresh wet hops produced one pound of dry hops. Dried hops were analyzed for content of alpha acids, beta acids and essential oils, which are critical to hop quality and flavor for brewing the various beer styles. Hops from Cascade and Comet contained higher alpha acids compared to those same varieties produced outside of Florida. Like grapes grown for wine production,hops are known for terroir (environmental conditions) effects. We expect that hops grown in Florida may produce unique characteristics in craft beers. Florida has a long frost-free period. Florida growers can potentially produce two crops per year from the same plants. In 2018, the spring crop at GCREC was harvested in mid-June.The 2018 fall crop cycle began in late July and is under evaluation. Research data indicated that hop varieties differ in their response to spring and fall cropping cycles. Some varieties that didn’t perform well in the spring cropping cycle are growing well in the fall, while some that grew well in the spring are now falling behind. We expect to harvest the fall crop in late November to early December. Hops are perennial crops that take several years to mature and reach full productivity. When grown in the Pacific Northwest, a mature hop plant can remain productive for up to 20years. How fast hop plants reach full productivity and retain their productivity in Florida’s climate remains to be determined. The potential for getting a second hop harvest in a year is new to the global hop industry, yet it may provide a significant advantage to Florida growers and brewers. Much research is needed to test the potential of this system. As the hop trials at GCREC continue,hop varieties that are reliable and sustainable will be identified, and optimal fertilization, irrigation and management recommendations will be developed. Zhanao Deng is a professor, Gary Vallad is an associate professor and associate director, and Shinsuke Agehara, Hugh Smith and Johan Desaeger are assistant professors — all at the UF/IFAS GCREC in Wimauma. This article was featured in the December issue of VSCNews magazine. 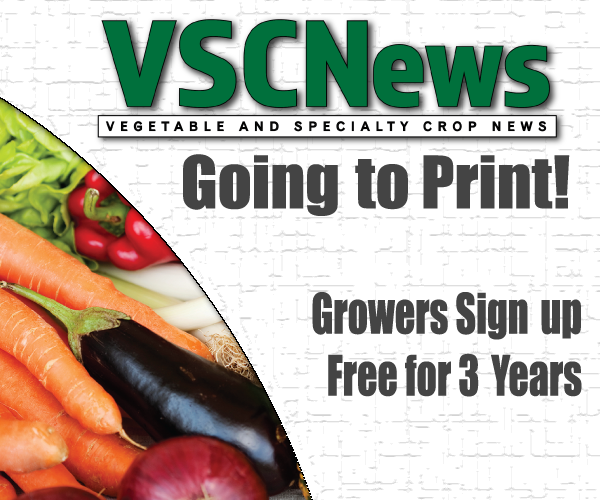 If you would like to receive future issues of VSCNews magazine, click here.